The video was produced by Manba’ al-Jihad Media for Production, which has long been affiliated with the Haqqani Network and was folded into the Taliban’s media arm years ago. The production was disseminated on the Taliban’s websites and social media, including on accounts affiliated with the group’s spokesman. The video is also attributed to the Islamic Emirate of Afghanistan’s Commission for Cultural Affairs. Until late 2001, the Taliban ruled over its own emirate inside Afghanistan and it has retained that name to this day, as the jihadists hope to resurrect their nation. The propaganda film opens with clips of Secretary of State John Kerry and President Barack Obama discussing the prospect of a peace deal with the Taliban. 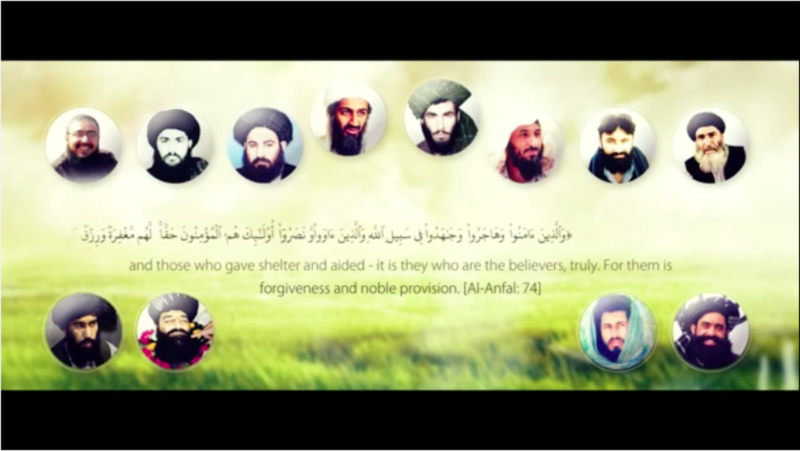 The Taliban responds with an old audio message from Mullah Akhtar Mohammad Mansour, who was named the emir of the Taliban in 2015 after the organization was forced to admit that Mullah Omar had passed away two years earlier. Mansour was killed in an American airstrike in May. Taliban officials often claim that they seek negotiations with the West. But the Taliban has used such talks to extract concessions, without giving up anything of substance. And these negotiations are different from true “peace talks,” which the Taliban’s senior leadership rejects in the video. 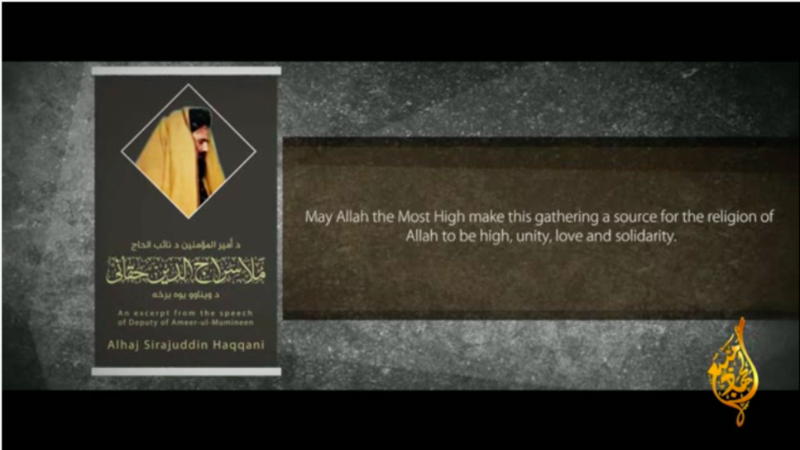 An excerpt from a speech previously recorded by Siraj Haqqani (seen above), one of the Taliban’s top deputy leaders, is also featured. Haqqani has long been closely allied with al Qaeda. These ties are documented in Osama bin Laden’s files and can be seen in other evidence as well. A clip from Sheikh Khalid Batarfi (seen above), a senior official in Al Qaeda in the Arabian Peninsula (AQAP), is also included. Batarfi is an al Qaeda veteran who was trained and fought in Afghanistan during the 1990s. The Long War Journal assesses that he is likely part of al Qaeda’s global management team. Other AQAP leaders with similar dossiers served dual roles as both regional officials in al Qaeda’s network and as members of the organization’s senior management. On top of these jihadi migrants was “our Sheikh and Imam al Mujahid Osama bin Laden (may Allah accept his martyrdom),” Batarfi says, referring to the fact that the Taliban did not break with bin Laden even after the 9/11 hijackings. Batarfi heaps praise on the Taliban and says that Afghanistan’s jihadists will “destroy” the US. 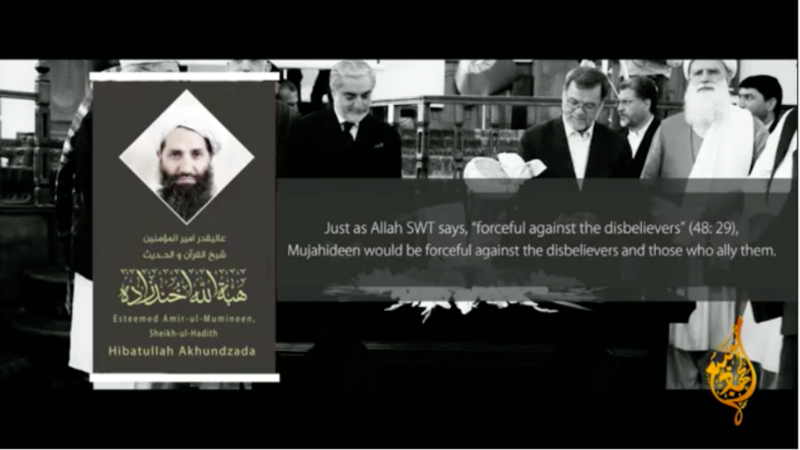 In yet another audio clip, Hibatullah Akhundzada, the current emir of the Taliban, explains that the “mujahideen must be very lenient towards the Muslims and very forceful towards the disbelievers.” He advocates for a more forgiving version, even if only slightly, of the jihadists’ strict ideology. Akhundzada believes that Muslims should be given a chance to repent and see the supposed errors of their ways if they do not worship and live as the Taliban does. The Taliban’s desire to win popular support is consistent with their role as insurgents, as guerrilla fighters often depend on the citizenry’s goodwill to accomplish their goals. This has often forced the Taliban, as well as al Qaeda and other like-minded extremists, to walk a fine line between imposing their draconian laws and alienating the people. The “muhajideen want to completely eliminate democracy,” one speaker says. In another clip, leaflets written in Uzbek are distributed. Even while marketing itself as a benign force, the Taliban cannot hide its misogyny. One member criticizes Afghans who do not join the jihad, arguing that if the West can bring its women into the war, then young Muslim males have no excuse for failing to fight. The Taliban’s anti-Americanism is on full display. And while the group is often described in local or nationalist terms, some scenes make its global ideas quite clear. The Taliban speaks of the ummah, the worldwide community of Muslims, and the jihadists’ desire to reclaim all lost Muslim lands. But America stands in their way. The Taliban claims that the US wants to create distance between Muslims and their religion. But the mujahideen will make America pay, the Taliban claims. “Allah will shake the White House [with] your [the Mujahideen’s] religious zeal by the permission of Allah,” the Taliban threatens. The Taliban also makes an argument that is very similar to the one adopted by al Qaeda in the 1990s. Al Qaeda became infamous for alleging that the US was propping up Muslim dictators who stood in the way of jihadi rule. In case there was any doubt about what the Taliban believes, the video makes it clear that the Taliban’s version of Islam is, in their eyes, the only true one. And it is the same version of Islam as al Qaeda’s. They really are asking for it with productions like these. How funny they start their movie with a cameo from their friend Hanoi John. They love and cherish death for Allah far more than life. They would see the end of the world as a victory with mass inhalation of man himself.